MOUNT GILEAD — Mount Gilead outlasted Northmor to win a 55-40 shootout on Friday. The Indians broke open a 27-26 game with three straight touchdowns in the late third and early fourth quarters and then held on for the win to improve to 4-4, 2-3 in league play. The Knights are still looking to break into the win column this year. Northmor struck first in the game after receiving the opening kickoff. After a long return by Demetrius Johnson put the ball on the MG 40, Conan Becker took the ball 33 yards inside the 10 to set up a two-yard jaunt by quarterback Jordan Wiseman to put the Knights up 6-0. That lead would not hold up long, though. After taking the ensuing kick to their 38, the Indians drove down the field in a 10-play drive, all on the ground. The biggest play of the drive was a 20-yard scramble by quarterback Tyler Bland and the drive was capped by a four-yard run by Jonah Barnett. Scott Page added the extra point to put MG on top by one point. After forcing a Knight punt, the Indians were back in business, taking the ball 58 yards in eight plays. Bland completed a pair of passes on this possession, hitting Anthony Clark for 11 yards early in the drive and then finishing it with a 30-yard scoring pass to Mason Mollohan. Entering the second quarter, Mount Gilead had a 14-6 lead. Northmor would drive into Indian territory, but Bland intercepted a pass to end that threat. Mount Gilead then ate six minutes off the clock with a 13-play drive that ended in the end zone on a two-yard run by Barnett. The senior back took the ball six times for 32 yards on that possession as the Indians increased their lead to 20-6 with 3:13 left in the opening half. That was evident from the final three minutes of the half, when the Knights erased MG’s lead. They struck quick on their next possession, getting a 56-yard run from Johnson to close within a 20-12 margin. Northmor would then force a punt to get the ball on their 32 with 37 seconds remaining. On their first play, Johnson struck again, running for 63 yards deep into Indian territory. After the team lost yards on the next play, Wiseman connected with Nathan Hall for an eight-yard touchdown. The same duo hooked up again for a two-point conversion, tying the game at 20 going into the locker room. The Indians scored quickly in the third quarter, getting a 57-yard touchdown run by Barnett to take a 27-20 lead. However, Northmor struck back, getting a 40-yard score by Johnson, but not converting a two-point opportunity, to close within one point. The Knights would not be able to get over the hump, though, as the Indians scored on another long drive. Mount Gilead went 62 yards on 11 plays, all on the ground. Clark had six carries for 37 yards on the drive, including the final two that took MG into the end zone. Page’s extra point made the score 34-26 with 4:23 remaining in the third. “We had some great plays, but just not enough stops to get it in our favor,” said Trainer. Northmor would have to punt on their next possession and the Indians would make them pay, as Barnett busted another long touchdown, this time running 52 yards to give his team a 41-26 lead. The Knights then threw an interception, which led to Mount Gilead scoring again. A 35-yard pass from Bland to Hunter Trimmer put the ball on the Northmor 10 and Barnett would score on a short run four plays later. Northmor would thrown another interception, but their defense would hold this time as they forced an Indian punt. Johnson opened their drive, which started at the 20, with a 31-yard run. After two runs from Becker and a pass from Wiseman to Kolton Smith netted 28 yards, Johnson would finish the possession with a 21-yard scoring run. Leading 48-32 with 5:31 to play, the Indians added to their advantage by scoring in four plays. Bland finished the drive with a 19-yard run for points. Northmor would get a 14-yard scoring pass from Wiseman to Garrett Gillispie and a two-point run by Johnson to close within 55-40, but they wouldn’t get the ball back, as MG was able to pick up the win. 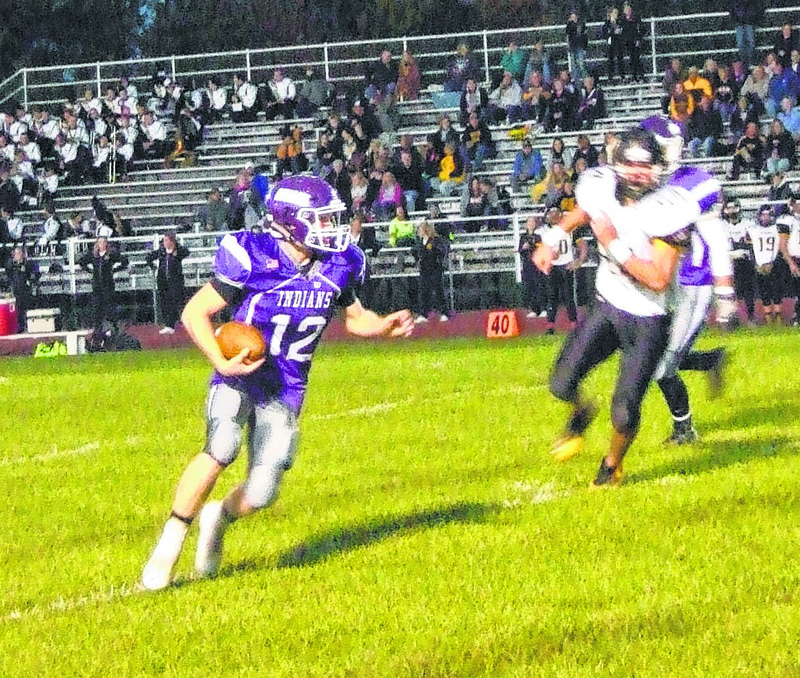 Mount Gilead’s 55-point explosion should give them some momentum going into their final two weeks, when they play both Centerburg and Highland on the road.